IPS delta dispensing systems can be equipped with one or two blenders for an optimal homogenisation and quality of textile printing paste. The automatic blender is a one-head blender completed with a scraper and washing unit. It is suitable for most bucket types. A minimum of about 10 litres of paste in the bucket (or a bucket with a paste level of at least 150 mm) is needed to guarantee a good mixing result. The bucket is clamped during blending. After blending, the blender element and shaft are automatically cleaned in the washing unit. The automatic bucket blender consists of a stainless steel blender element and shaft driven by a frequency-controlled electric motor. The blender is powered by pneumatic up/down and turning mechanisms. For optimal blending (in the centre) the bucket is centralised on the roller conveyor by a bucket centring and clamping mechanism. The blending process is optimised by the scraping unit, which scrapes the bucket walls during blending. 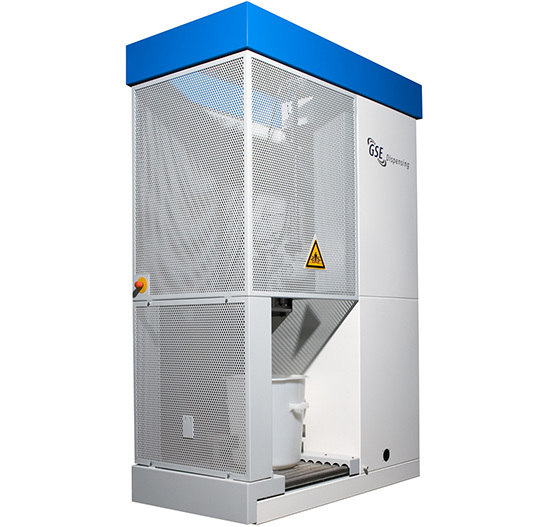 IPS delta dispensing systems can be equipped with manual or automatic bucket handling. With automatic bucket handling, the automatic roller conveyor consists of non-driven supply conveyor (standard one, optionally up to three), a driven conveyor on the scale, another driven conveyor underneath the mixer and a non-driven discharge conveyor. After starting the order, the system takes the needed empty bucket from (one of) the supply conveyors (predefined by the user in the control software) and centres it on the track. The bucket is moved to the dispensing head and filled with paste according to the recipe. After dispensing it is transported to the blender by a driven roller conveyor. The bucket contents are blended until the paste is homogeneous. The bucket is transported to the discharge conveyor, where it can be removed.